Chicago, IL - Lapham-Hickey Steel, a full-line specialty steel service center with processing and distribution facilities in Chicago, IL, Oshkosh, WI, Eagan, MN, St. Louis, MO, Memphis, TN, Pawcatuck, CT, and Columbus, OH, installed a new high production close tolerance single loop coil slitting line with shape correction leveling in its flagship facility in Chicago. The new slitting line, Lapham-Hickey's 14th, is capable of processing 40,000# x 60" wide coils in gauges from .015" through 1/4" at speeds to 1,000 FPM. Designed, built, and installed by Braner/Loopco, Schiller Park, IL, this new line includes a number of features designed to produce high quality close tolerance slit coil in a highly efficient manner. Slitting 10 Cuts in .135"
Three Slitter Heads: The new line is equipped with an efficient "Turret Head" Slitter equipped with three slitter heads, which allows Lapham-Hickey to prepare new set-ups on two heads while operating with the third slitter head. Turret Head slitters feature freely accessible arbors that allow faster tool removal and installation, with the ability to change slitter heads in about one minute. Each slitter head is equipped with 10" diameter arbors driven by a 250 HP motor, giving Lapham-Hickey the ability to slit 8 cuts in 1/4" and up to 20 cuts in .135" and thinner materials. Shape Correction: A "Cluster Leveler" allows Lapham-Hickey to eliminate strip shape defects such as wavy edge, center buckle, and slitter knife induced cross-bow throughout a gauge range of .015" through 1/4". The Cluster Leveler is a patented "adjustable back-up" roller leveler equipped with multiple diameter work rolls arranged in "clusters". The gauge capacity of a roller leveler is directly proportional to its work roll diameter and roll centers, with light gauge requiring small work rolls mounted on close centers, while heavier gauge and high strength materials demanding larger work rolls on relatively wide centers. The "rule of thumb" is that a roller leveler has an effective gauge range of between 3x to 4x the minimum gauge, with diminished shape correction ability outside that range. The Cluster Leveler solves the gauge range limitation problem by incorporating a series of work rolls ranging from 1.500" diameter through 3.000" diameter, allowing the user to effectively shape correct throughout a wide range of gauge and yield strength material. The Cluster Leveler is able to apply small work rolls on light gauge material, and apply large rolls on heavier gauge and high strength material. 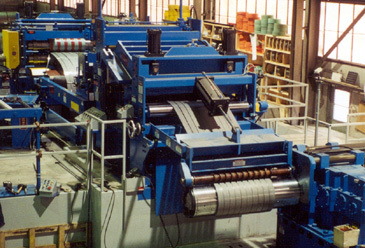 The work rolls are supported on multiple back-up flights, all of which are adjustable for work roll bending. 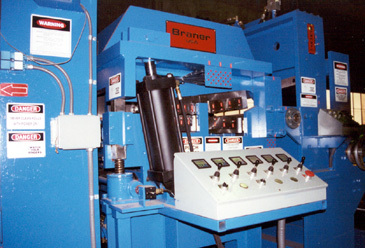 Roll bend is required to effect precise strip shape correction without employing extreme "stretcher" tension. Excessive strip tension may cause slit strips to "neck" (become narrower than the slitter set-up), and also induce camber. An onboard computer automatically selects the appropriate work roll cluster and establishes the appropriate work roll position based upon material gauge and yield strength input by the operator.